Risk is a fact of life. Whether you’re a vehicle finance lender, a credit union, or a buy-here-pay-here car dealer, you must face the possibility that a borrower will not keep up with payments. Credit checks are a good safety measure, but they don’t always predict customer behavior. With talk of a bubble in the auto finance sector, and the potential of increasing default rates, some lenders are becoming more conservative in terms of what financing they are willing to approve. This means you might find yourself faced with a larger number of subprime buyers, and therefore if nothing changes, you’ll need to accept more risk or take less business. In a risky environment, smart businesses take steps to lower their risk. Picking the right company to help is becoming increasingly important. In the event that you need to locate, disable or recover a financed asset, time is of the essence. Every day that car’s whereabouts are unknown, you are losing money. Here are a few facts that we think make CalAmp your best partner for vehicle payment assurance. 1. The most trusted solutions come from an environment of accountability. CalAmp is a public company, which means we must face the scrutiny of the public eye in how we conduct our business. With the only ISO certification in the vehicle finance industry, we focus on security and reliability. 2. Over the last 35 years, we’ve built a well-deserved reputation for quality and stability, but that doesn’t mean we shy away from the cutting edge. As a large company, we invest assertively in research and development to keep our technologies ahead of the game. We know that’s how to keep our customers happy. Stay tuned as we are refreshing the LenderOutlook platform with state-of-the art technology. 3. We know that security is a practice, not a product. We are continually refining our security strategy, which comprises numerous layers of protection for both hardware and software, including encryption, anti-tampering measures and alerts. All this goes into the highest quality hardware, designed top to bottom for reliability and protection. 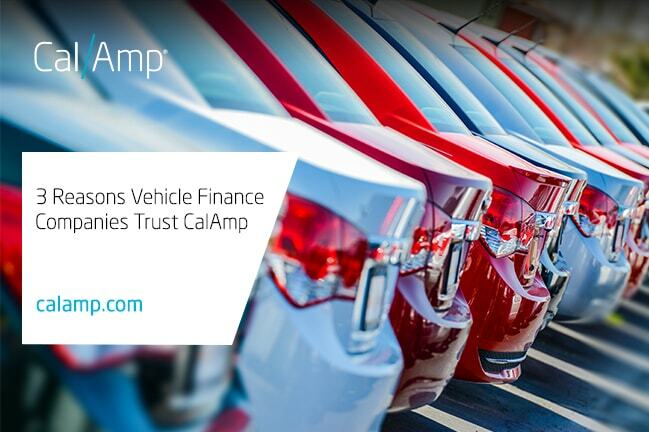 To learn more about CalAmp vehicle finance solutions, check out our solution brief or visit us at NABD, Booth 611. We will be showcasing our newly refreshed LenderOutlook solution and trusted our hardware expertise that, together, can help your business grow.